I, the now 40 year old Waist High, would like to thank my well wishers across the globe (literally), for not only your grim reminders that half of my life is over, but for all the kind words and curious questions. As far as 40 goes, it was not something that I wanted to have happen. As far as celebrations go, it was by far one of the best times of my life. I, along with a close friend of 25 years, took two weeks vacation from work and embarked upon a 7 day culinary tour of the Pacific Northwest. 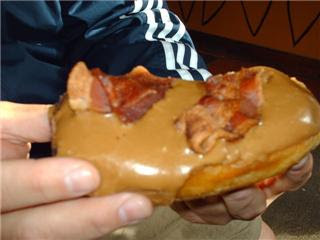 The journey began at Portland's own Voodoo Doughnut (please watch video of Chuck Palahniuk and Anthony Bourdain having the Voodoo Doughnut experience) with their legendary maple bacon bar, and ended in the lower level of Crave at the Salon of Shame in Seattle's Capitol Hill. If turning 40 is what it takes to be brought to tears by food so amazing, and experiences so unbelievable that they are not meant to be put into words, then by God drag me kicking and screaming to 40 all over again. My close friend of 25 years, who I might add experienced ABSOLUTELY NO GUILT WHATSOEVER for choosing this vacation, stated after all was said and done that he had never had a better time in his 40 years on earth, nor had he seen anything more beautiful than the sights we saw on our travels. I think I am now in good company with the 40 set, the best seems yet to come, and since I believe that age is just a number, I am now choosing to keep mine unlisted. One of my parents acknowledged my 40th and cut me a check, the other parent behaved just as expected, my coworkers couldn't believe I was only 40, my only living grandparent remembered (sort of), those important to me wished me well, my love interest made sure that I knew that "40 is hot!" the fruit of my womb more than likely spent the day fanning herself with her 57 dollars, and a good friend reminded me that, "Turning 40 is like peeing in the pool. If you're lucky, no one will notice." To the second half of life!